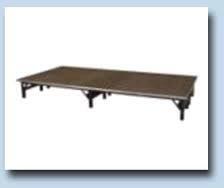 This 4'x8' wooden platform section can be set 8", 16" and 24" high. The platforms are a black non skid surface. * Please call us with any questions about our 4 foot x8 foot platform w/ non skid black surface rentals in Lenexa KS, Kansas City MO, Shawnee KS, Grandview MO.